Healthy honeybee colonies are crucial to maintaining the natural diversity of flowering plants and the global production of plant-derived foodstuffs. As much as 35 % of this production depends on insect-based pollination, in which the honeybee (Apis mellifera) plays a leading role. For fundamental research, too, the health of the honeybee raises some interesting questions and enigmatic solutions, whose revelation leads us to expect some key insights. Colonies of honeybees face pressure from a wide variety of pathogens and parasites (viruses, bacteria, fungi, protozoans, mites), against which they have developed defence mechanisms during their 30 million years of evolution. Additional anthropogenic (manmade) environmental and other stresses are other sources of affliction for the honeybee. The need to retain this key working animal, coupled with the complex context in which it is found, requires comprehensive basic research on the origins of bee health, the threats they face and our options for helping them. Fig. 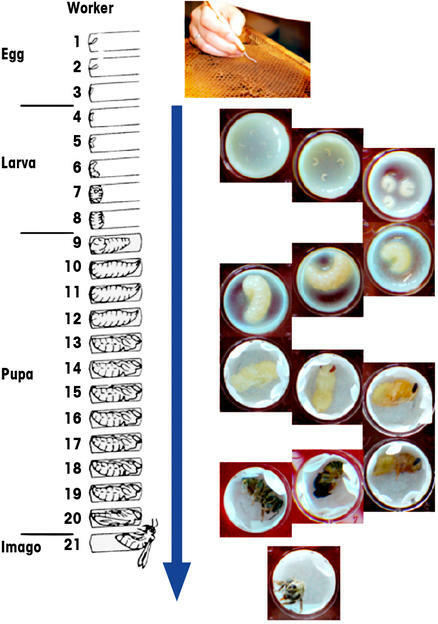 1 Development from egg to adult worker over time in the hive. 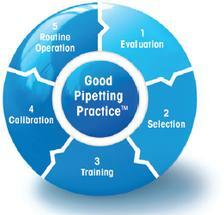 This sequence can be replicated using in vitro breeding. Like all insects, honeybees do not have an adaptive immune system. This disadvantage is balanced out by the following tools: (1) the chitinous shell, as passive external protection, and the gut epithelium as an internal barrier; (2) the cell-mediated and (3) the humoral immune response from the “inborn” immune system; (4) ­behavioural changes in infected worker bees, who fail to return to the hive; (5) brood care and hygiene, i.e. 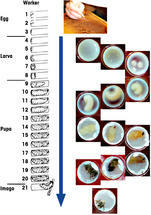 the removal of sick or dead individuals; and (6) details of the hive design and its climate control. To be able to study and understand these highly complex interrelationships with the aim of helping the honeybee, ultra-modern lab techniques are needed, plus a high-tech “bugging operation” in healthy bee colonies. Weight measurements provide insights whose significance for fundamental research into honeybees simply cannot be overestimated. This process begins with the continuous recording of the total weight of a beehive (see HOBOS), from which data numerous relevant conclusions can be drawn concerning the development and constitution of a bee colony. It continues with the weighing of individual honeybees at their various stages of development: experiments can then use this data to achieve insights into the impact of specific honeybee diseases. Last but not least, high-precision weighing of certain honeybee tissue fractions is used in methods from molecular biology. Fig. 2 Gel electrophoresis analysis of induced immunopeptides (links) in the haemolymph of honeybee larvae after injury and artificial injection with E. coli bacteria. With KB testing (right), it can be shown that the corresponding samples do actually possess antimicrobial activity. to injury and bacterial injection (using glass capillaries drawn to a fine point) with a strong humoral immune response. The de novo synthesis of at least three small-molecule AMPs (hymenoptaecin, defensin and abaecin) can be detected using a denaturing polyacrylamide gel. With the aid of KB testing, it is possible to show that the corresponding samples do actually possess antimicrobial activity, as can be seen from the large inhibition zones in samples 3 and 6 (fig. 2). Furthermore, the decoding of the bee genome in 2006 has now facilitated the systematic investigation of the molecular processes involved in pathogen defence in individuals at all stages (larvae, pupae, adults), in bee castes (workers, drones, queens) and in the overall honeybee colony superorganism”. Fig. 3 The big HOBOS bugging operation involving a healthy honeybee hive. A wide variety of video systems and a whole host of sensors offer the possibility of continuous monitoring and measurement of an undisturbed bee colony. 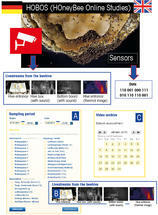 An array of cameras and sensors, coupled with a completely new kind of internet platform, permits the highly-detailed study of a living bee colony and its environment. HOBOS provides live video streams via a camera at the hive entrance with infrared capabilities, a thermal imaging camera, two endoscope cameras with microphones that film the hive box and bottom board, and an infrared-capable camera that logs environmental and weather conditions in the garden. HOBOS also offers data streams – real-time and historical – on the bee colony, vegetation and weather conditions. Metrics relating to the hive weight, relative humidity and temperature, temperatures in the eleven gaps between the frames, the temperature at the front and back of the hive, and incoming and outgoing honeybees can also be reviewed (fig. 3). An RFID chip, which stores important data about individual honeybees, enables certain types of bee behaviour to be recorded automatically (fig. 4). Readings are also taken from the hive’s immediate vicinity and include air pressure, temperature and humidity, the atmospheric electric field strength, precipitation, wind speed and direction, solar radiation, soil moisture and leaf wetness. These supplement the hive data, turning HOBOS into a one-of-a-kind eco project. Fig. 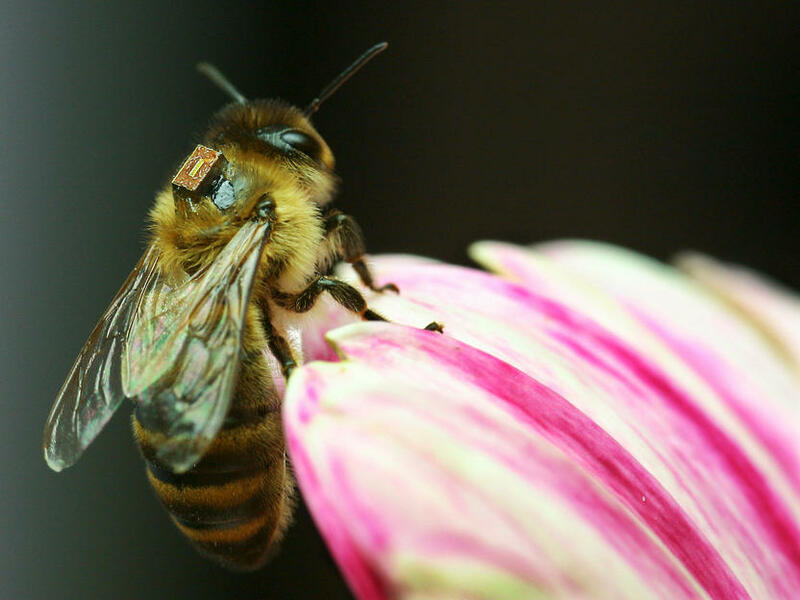 4 The RFID (radio frequency identification) chip stores important data about individual honeybees and enables certain types of bee behaviour to be recorded automatically. Yet HOBOS is not only a set of tools and an open-access laboratory for honeybee research: it is, above all, an interdisciplinary platform for scientific education and training that is also ideally suited to deployment in educational facilities within the life sciences. First publication: Tautz, J., q&more, 2.2014.